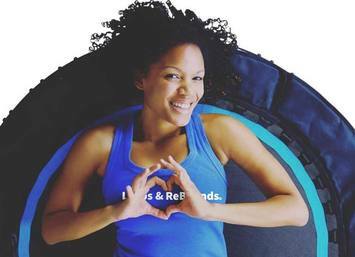 Whether you are a fitness fanatic or completely new to exercise, rebounder training can be an excellent addition to your wellness routine. This form of exercise has all the cardiovascular and weight loss benefits of other forms of exercise, with the added benefit of being very gentle on the joints. Many people who enjoy rebounding choose to purchase their own rebounder for home use, and there are many different brands and models available. One brand that has caught our eye recently is Leaps and Rebounds. So, would one of these rebounders suit you? Read on for our Leaps and Rebounds review! What makes the Leaps and Rebounds rebounder stand out? How does Leaps and Rebounds compare to other brands? Where do I find the Leaps and Rebounds rebounder for sale? Latex bungees: These bungees are very flexible, which allows for a smooth bounce action. Also, bungees are quieter than the springs used in many models. This is a great feature if you don't want to disturb family members or living companions with squeaky springs. Bungee safety cover: This feature provides extra safety as it prevents your feet getting caught between the jumping mat and the frame. Gaps can lead to nasty trips and falls, so we're pleased to see that Leaps and Rebounds have included this in their model. ​Carbon-steel frame: This gives the frame more strength and durability, allowing the rebounder to withstand longer periods of heavy use. ​Range of colours: The decorative trim on the jump mat comes in a choice of colours, so you can choose a rebounder that suits your personal taste. UV-resistant jumping mat: If you're planning on using your rebounder outside, then a UV resistant mat is a good option. Over time, UV rays from the sun can cause your jumping mat to perish, so this feature makes the product more durable. You may be wondering whether a bungee rebounder like the Leaps and Rebounds model is the best option, or if you'd be better off with springs. Is there really any difference? There are two main areas where the two options differ: noise and bounce. Bungee trampolines are more-or-less silent to bounce on. On the other hand, springs usually create a 'squeaking' or creaking sound, especially after prolonged use. Therefore, if you are looking for a silent rebounder, bungees are the way to go. Spring rebounders give a more firm-feeling bounce, and this allows users to perform actions such as jogging movements more easily. 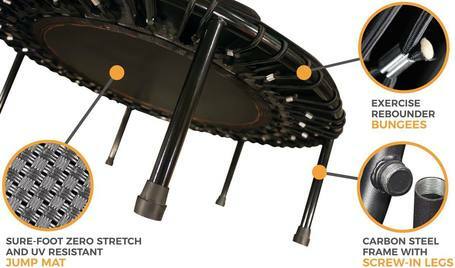 However, a bungee trampoline gives a softer bounce, which is gentler on joints and ligaments. Therefore, whether you choose a spring or bungee rebounder comes down to your personal needs and preferences. 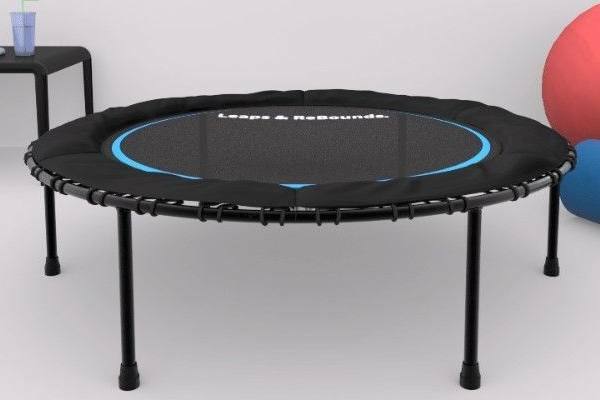 Before you run out and purchase your new rebounder, you'll want to know whether the Leaps and Rebounds mini-trampoline is comparable to other popular brands. To help you figure this out, we've compared it to another leading rebounder manufacturer, Bellicon. Overall, the Bellicon and Leaps and Rebounds rebounders are pretty comparable. Both have a sturdy and durable design and use bungees as opposed to springs. However, Bellicon does have a few advantages over the Leaps and Rebounds offering. First, you can purchase it with foldable legs, making it easier to store. Also, Bellicon offer a choice of bungee strengths, and have a higher weight limit. This makes them more suitable for plus-size users. On the other hand, the Leaps and Rebounds rebounder comes at a more affordable price point. If you're looking for the quality of a Bellicon rebounder on a budget, this model could be a good solution. The upper weight limit of the Leaps and Rebounds rebounder is 200 lbs. Overall, we are impressed with the Leaps and Rebounds model and it has several great features. The safety cover over the bungees prevents feet from getting caught, preventing nasty trips and potential injuries. The bungees provide an excellent bounce action, making it ideal for joint pain sufferers. 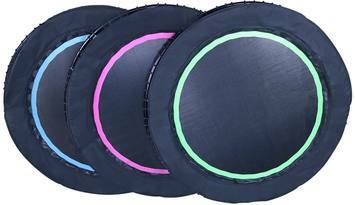 The rebounder is also super-stylish, and it's great that there are a range of colours to suit your own taste. If you have any issues with your balance or are new to rebounding, this model may not be ideal as it does not include a stability bar. Many brands nowadays include this as standard. On the other hand, as this rebounder is reasonably priced you may well be able to afford a stability bar as an accessory, which can be purchased from the manufacturer's website. Also, foldable legs are an option we would like to see, as they would make this rebounder more suitable for those who are short on space and want to be able to store their rebounder away. 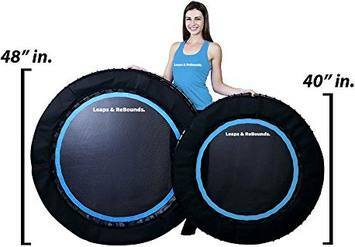 The Leaps and Rebounds rebounder can be easily purchased on Amazon. Click here to check latest prices on Amazon. Hopefully, now you've read our Leaps and Rebounds rebounder review, you'll have a clearer idea of whether this model is the best choice for your needs. Overall, we believe this rebounder is a great option for those who want to buy a durable and quality product at a more affordable price. Happy bouncing! Click here to buy on Amazon.